For: all PKs (priest kids), those who are raising them, and those who know them. Plus, anyone who has been subject to unfair expectations (so basically, all of us). I was holding my three-month-old the first time someone called her out as having special expectations because she was a priest’s kid. I looked down at my sleeping daughter, absolutely adorable in a caterpillar costume that her grandmother had lovingly, painstakingly made. The butterfly wings that I wore drooped. I had known intellectually and anecdotally about the not-so-great expectations of PKs, but this was the first time I felt the gut punch. It wasn’t the last. (And for the record, she won the under-2 costume contest because her caterpillar was the cutest. IMHO). A few years later, I was giving a bottle to our infant son when our toddler daughter walked up to her daddy (the priest) while he preached from the aisle. Without missing a beat, he picked her up and continued. Afterward, I was scolded by a member for not having more control of my children. When our son was seven, a vestry member raised an issue during a meeting. They told my husband in a vestry meeting (! ), that some people didn’t like that our son occasionally played with my phone or an iPad during worship. This time, I wasn’t wearing butterfly wings, but my hackles rose. He’s seven and sometimes wiggly. Would they prefer he roll under the pews? Seven-year-olds don’t always have an hour’s worth of quiet attention. And, was the vestry member calling for a ban on all iPad and phone usage during the service or just for the son of the priest? 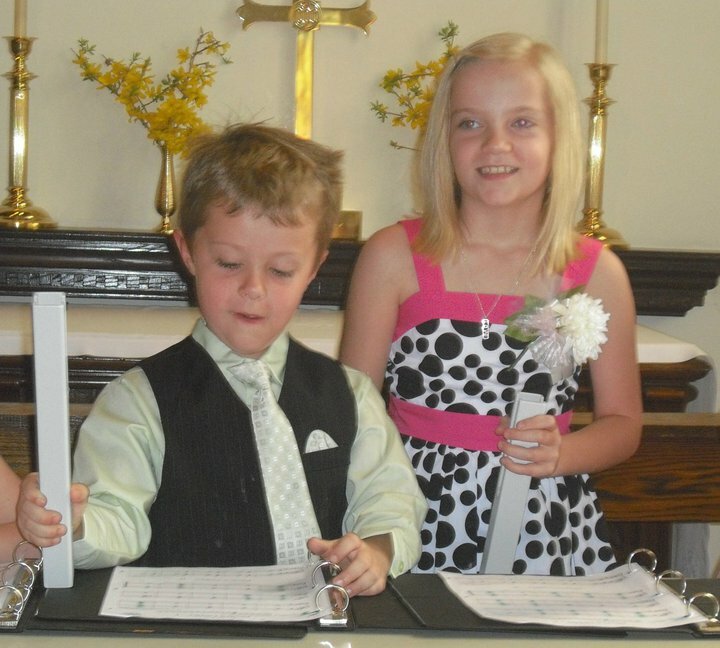 A day (many years ago) when they both were excited to ring chimes in church. My husband and I have tried very hard to make sure that the expectations we have for our children in church are ours, not those imposed by others. When our son puts on (nice, leather) flip flops, I stop and try to filter whether it’s my fear of what others will say or whether I think they are inappropriate. He gets to wear them. When our daughter comes down the stairs in shorts showing a hint of cheek, I stop and think about whose expectations I’m letting govern my decision. That’s an easy one: Mine. And she heads back upstairs to change. When they don’t want to go to youth group, Sunday School, or children’s choir, we try to discern whether it’s laziness, apathy, or that the activity is really not the right fit. We don’t expect other children in our congregation to be at the church every time the doors are open. Ours shouldn’t have to be there too. Being a priest’s kid is hard (although frankly, being a kid is hard too). But there are some extra expectations for the children of priests. 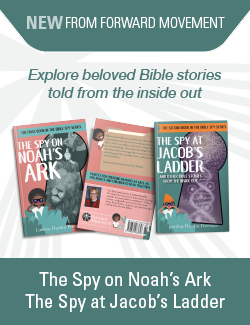 People assume that the children are either pious, Bible-toting, goody-two-shoes, or rebels raging against the machine, God, and their parents. Most PKs are somewhere in the middle, trying to find out who they are and who they want to be. Foisting our expectations on them isn’t fair. And it makes this mom’s heart ache. We are not alone in facing not-so-great expectations. Children of teachers and community leaders have a particular set of expectations too. Frankly, we have all been hemmed in by expectations. You’re tall, so you must play basketball. Except you’re an artist and an ice skater. You’re from Appalachia so you might be a little slow. You’re poor so you must be lazy. You’re fat so you must not have self-control. You’re rich so you must be happy. One of the great lessons of Jesus’ life is his overturning of expectations. A king born in a stable? A child teaching the teachers? A rabbi eating with prostitutes and lepers? A savior dying between two criminals? Jesus’ unexpected life (and death and new life) urges us to set aside our expectations and preconceived notions, to love instead of judge, to be amazed by what is, instead of what ought. How have you seen expectations hinder the growth of clergy kids? of anybody? Sorry your church expects your children to be perfect. I always tell people that children, PKs or not, need to be in church. Will they always behave like we would like them to? of course not – we didn’t either. The only way anyone learns how to be in church is to be there and people need to remember that at one time they were wiggly kids also. Martha, Thank you for your kind words about children in church. I totally agree that wiggly kids belong there too! One thing though is that if it was just one congregation, I could dismiss it as an outlier, an exception. But the examples that I mentioned are from three different churches (of different sizes, geographic location, and two denominations!). My church now (which was the third example) is very accepting and welcoming to children — but there are still individuals who have double standards (even if they sometimes don’t realize it and they think they are being well-intentioned). Well said, Richelle!! With 2 PKs myself, I understand. I think my kids played every animal part possible in various Christmas pageants. Coffee hours were long for them, but now they say it’s where they learned to shake hands and have conversation. And once someone died right after one of our sons sat down to play cards with her on a nursing home visit. Yikes! Issues of mortality and faith at very young ages. I guess there are worse ways to grow up. Lots of challenges, lots of joys. Keep up the good work! Thanks, Lindsay. You’re definitely right that there are some wonderful joys and opportunities with being PKs — and I wouldn’t trade it! I suppose like any part of parenting, it just takes some careful navigating! Thank you, Richelle. We are raising double PKs (both parents are priests) and for years it meant two churches with two sets of expectations. My husband has dealt with the phone calls on Monday morning complaining about our sons behavior as a 3 year old that sounded a lot like the vestry meeting you described. Thank you for distinguishing between my expectations and the parish’s expectations. After years of making clothing, participation and quiet church toy decisions based expectations of church members, I realize now how blurry the line has grown between what I expect and what they expect. Looking forward to thinking this through some more. Thanks, Allison. It’s hard for me too to distinguish between the expectations. Sometimes I get it right and sometimes not. I’ll be thinking of you and your husband — double duty has to be hard! Great article! I am an Episcopal PK too. People assumed I was an angel or devil. As you identified, the reality is I was somewhere in between. Thank you for sharing your experience. I could say more but it sounds like I am lecturing. This is what the priesthood is about, so I’d say get used to it. I once had a neighbor tell me I shouldn’t cut my grass on the sabbath. I said, “this might be your sabbath, but it isn’t mine. I work on Sundays.” Feel comfortable in your own skin and you won’t have to worry about what others think about how you raise your children in church, or anywhere else for that matter. Thanks for commenting – and I’m not sure what’s different about your experience, even across generations. I see Richelle describing experiences she has had in congregations across many years of taking kids to church faithfully. I see you describing your experience of taking kids to church faithfully. I don’t see Richelle worried about what others think of her – I see her concerned for the impact on her kids of the expectations that are different for them than for other children of the church. For all of us who want to pass on a faith which practices equity and compassion across all generations, I think the concerns she raises help us to be mindful of the reality of life for clergy kids – and for all of us.